Posted on Thu, Oct 20, 2011 : 2:55 p.m. 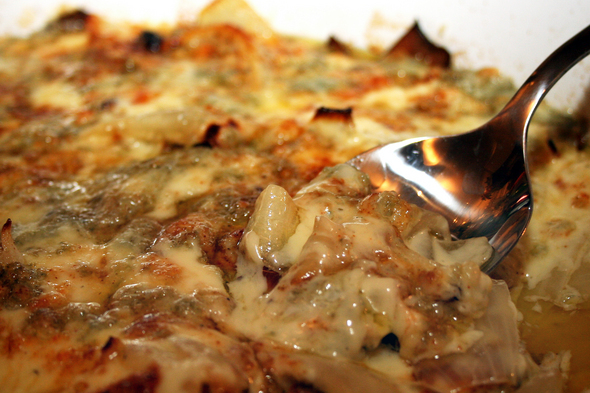 It may not be terribly photogenic, but this creamed onion gratin is incredibly tasty. It finally really feels like autumn in Michigan. The trees are brilliant hues of red, yellow and orange. After much back-and-forth, I think we’ve finally decided on a Halloween costume for the 9-year-old. Now it’s time to start thinking about Thanksgiving. Every family has their own peculiar holiday food traditions. In our family, it’s not Thanksgiving without my grandmother’s green gelatin mold, a traditional stuffing (variations are not tolerated by my brother and me), my mother’s amazing apple pie and creamed onions. The creamed onions are for my dad. Every year, my mom asks my dad if he really wants those creamed onions again this year, since he’s usually the only one who eats them. And every year, my dad makes that puppy-dog face, and my mom says she’ll make them this one last time. This year, I’m hosting Thanksgiving dinner for the first time. I’m a little bit nervous about pulling it all together and getting it all on the table at the same time. I’ve been calculating cooking times and eyeing my oven to see just how much I can fit in there. I’ve also been rethinking my dad’s creamed onions. My mom’s willingness to peel and prepare several cups full of pearl onions for this dish is a true testament to the love that has gone into their 41-year marriage. I love my dad — a lot — but I don’t think I’ll have the time or patience for pearl onions this Thanksgiving. Luckily, the latest issue of Saveur contains a recipe that seems like a pretty good compromise. This rich creamed onion gratin uses yellow onions, which require much less prep work. The Gorgonzola adds a nice tang, but a nutty Gruyere would work well too. And I love how sweet the onions taste after an hour in the oven. The great thing about this dish as a Thanksgiving side is that you can cook the onions right along with your turkey. Once you’ve got everything else ready to go, it just takes a quick couple of minutes under the broiler before it’s ready to be served. 1. Heat oven to 350 degrees. Toss onions with oil in a 9x11-inch baking dish and season with salt and pepper. Bake, stirring occasionally, until soft and lightly browned, about 1 hour; set aside. Heat oven to broil. 2. Heat butter in a 2-quart saucepan over medium-high heat; add flour, and cook, stirring, until smooth, about one minute. Add cream and wine and cook, stirring, until thickened, about 5 minutes. Season sauce with salt, pepper and nutmeg. 3. Pour sauce evenly over onions. Sprinkle with parmesan, dot with Gorgonzola, and sprinkle with paprika; broil until cheese is melted and golden brown on top, about 2 minutes. Wed, Oct 26, 2011 : 4:54 p.m. I didn't make this recipe as-is, but I was inspired by reading it to combine it with a recipe I recently ran across for butternut squash gratin. The sweetness of the squash and the sweet-savory of the onions went together incredibly well with the cheese &amp; cream! Fri, Oct 21, 2011 : 1:42 a.m.
Mostly I say this from experience with letting the cream/butter mixtures soak into the primary ingredients, instead of &quot;artificially&quot; thickening them with flour and then just throwing them together at the last minute. But hey, cooking is about experimentation so this sounds like a fun alternative to the standard potato or cauliflower au gratin or cream of mushroom/green bean casserole. Fri, Oct 21, 2011 : 1:40 a.m.
Huh, kind of an unexpected recipe. I love onions so this sounds right up my alley, but it seems strange that the recipe only calls for broiling the total mixture for about 2 minutes after cooking the onions for 60. Usually I'd think you'd want to cook the onions along with the other ingredients for much longer to really bring out the flavors, instead of just baking them with a little oil &amp; seasonings. Did you already try out this recipe exactly as written? What do you think about experimenting with a shorter Step 1 baking time, and a longer Step 3 baking/broiling time (maybe reserving the cheeses until the very end)? Thu, Oct 20, 2011 : 8:30 p.m.